Gangtok is located in the Shivalik Hills of the eastern Himalayan Range. Surrounded by many peaks of the Himalayas, Gangtok has been a major pilgrimage centre for Buddhists. 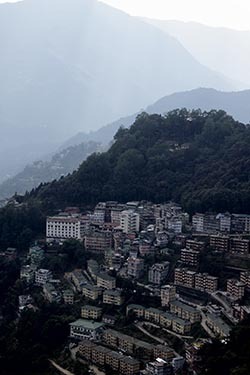 Many monasteries, small and big, dot Gangtok and the State of Sikkim. 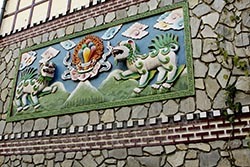 Thanks to its picturesque location and mild temperatures, this hill town attracts tourists from far and wide as well. While summer months have an edge with visitors, the winters provide its own charm. I decided to spend my New Year in Gangtok. I had 3 days on hand to explore. Really speaking, it was just 2 days since most of the day was lost in transiting from Bagdogra airport to Gangtok. The distance is only 125 kms but it takes at least 5 hours to negotiate the distance due to the hilly terrain, bad road condition and traffic jams. Sure the road from Bagdogra to Gangtok is National Highway 31A but that’s it. I like you to know that road works, under military supervision, is under way. Once done, I hope the journey to be a breeze. The presence of army camps all throughout the State suggests the sensitivity of the location. Sikkim borders with China. While Indian nationals have access to travel the State, foreign nationals need to have special permits. I have touched more on this in my feature on Nathula. We were 2 couples travelling together. It thus made more sense to have a taxi for ourselves to move around. Public transportation is almost negligible. Private taxi operators cram their vehicles with passengers. Every vehicle will definitely have a few passengers sitting on the roof… probably that would be more comfortable than being within the vehicle! Whilst we had an option to take a flight from New Delhi to Bagdogra, we opted to board from Kolkata (formerly Calcutta). During winters, New Delhi airport is engulfed in fog thus delaying and sometimes cancellations of flights. Visitors may want to keep this tip in mind. Of course, Kolkata can have fog too, but the probability is in travelers’ favour. We landed at Bagdogra airport at 1:30PM. We had booked a taxi for the hotel transfer but unfortunately the taxi was still a couple of hours away due to traffic jams. There’s a pre-paid taxi booth in the airport premises. Rates are fixed to travel to various destinations most popular ones being Gangtok, Kalimpong and Darjeeling. The rate for Gangtok drop was Rs 2500. We paid an additional Rs 500 for the extra run to Mahindra Resorts which was about 8 kms from Gangtok taxi stand. On the outskirts of Bagdogra and Siliguri (it’s a main town in the State of West Bengal, only second after Kolkata) we took a brief lunch break in a dhaba (roadside eatery / restaurant). At about 3 PM began our journey. The road, all the way up to Gangtok is uphill. On one side are magnificent hills and on the other, down below, flows Teesta River – lifeline of Sikkim. Enroute are many small towns. One of them is Rangpo which is a border town that separates the State of West Bengal with the State of Sikkim. Army personnel do a brief check before allowing the vehicles to enter Sikkim. Once in Rangpo, travelers may want to purchase their favourite liquor. Sikkim has very little tax on liquor thus making buying bottles cheap. Cheers! It was 8:30PM by the time we reached our resort. After check-in, we enjoyed our dinner in the comforts of wood paneled rooms and were ready to call it a day. Locally Mahindra Resort is called The Royal Demazong. It’s a typical Tibetan architecture and the rooms overlook a valley… breathtaking as I realized the next morning. We had 2 days left. One for the city tour and the other for a trip to Nathula Pass. It’s mandatory for every Indian citizen to get a permit to visit Nathula Pass. Foreigners cannot visit Nathula Pass. They can only go up to Tsomgo Lake and that too with a permit. You need to allow a day for your travel operator to get the permit. Make sure to carry your photo identity and 2 photographs. The travel desk manages the rest. Please note that visit to Nathula Pass is not allowed on Mondays and Tuesdays. The cost for a taxi with visit permit was Rs 5800. I am told individuals are charged Rs 650 per head but then the taxi would squeeze in 10 passengers. Sikkim divides itself in 4 zones. East, west, north and south. Each region has its own charm. We would be spending our days in east Sikkim. 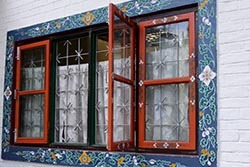 To be able to explore all of the regions, a traveler must plan for at least a week’s stay. For the city tour we hired a cab that would show us around town. The cost was Rs 1800. There’s no point going by the kilometers travelled… fares are all fixed. After a hearty breakfast, the next morning, we commenced our city tour at 10AM. The first stop was Ganesh Tok. This sacred shrine is dedicated to Lord Ganesha and is located about 7 kms on Gangtok - Nathula Road on a small hillock. Regarded to be a very holy and auspicious temple, this place is a must visit religious hamlet. 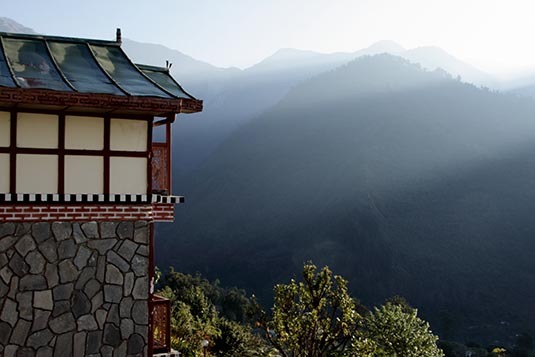 Perched at the elevation of 6500 meters above sea level, the location offers a bird’s eye view of the entire Gangtok region. Since the day was clear I could get a good view of Mount Kanchenjunga and the surrounding valley. My first glimpse of this majestic peak thrilled me. In my heart, I was actually worried if the weather Gods would be kind to me. Indeed they were! 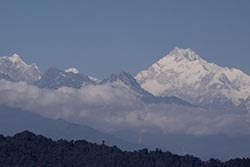 The word Kanchenjunga is of Tibetan origin which means, "Five treasuries of the great snow". The world’s third highest (Mount Everest is first; Mount K2 is second) pinnacle, and the highest peak of India, Kanchenjunga is surrounded by Sikkim in the east and the south, Nepal in the west and Tibet in the north. The topmost apex of this mountain range is 28,156 feet. From Ganesh Tok we drove towards Tashi Point. The viewpoint is named after Tashi Namgyal, the late king of Sikkim who constructed it. 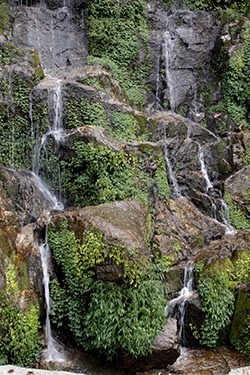 Tashi View point is situated along the North Sikkim Highway, about 8 kms from Gangtok. Astounding perspectives of magnanimous Mount Kanchenjunga and Mount Siniolchu can be enjoyed from here. Our next stop was Gunjam Monastery, one of the many in Sikkim. 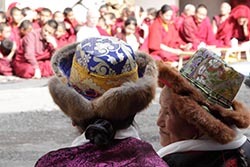 At the time of my visit, the inmates of the monastery were presenting a cultural program in front of their Guru. We were lucky to be there. His blessings we took. On our way to Chogyal Palden Park, we made a brief stop at Bakthang Falls. Water was just trickling down but I am sure during and post monsoon this would make for a mighty fall. Just opposite the falls is a small park that offers good view of the mountains and the valley. A tea shack offers good tea. And there’s a restroom too. Few kms above the M G Marg of Gangtok, is a small stretch of plain called The Ridge. 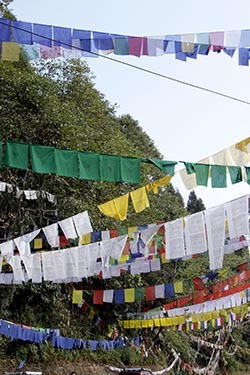 The place was recently renamed to ‘Chogyal Palden Thendup Namgyal Park’. The park has small fountain and a pagoda type resting place. It’s quite a popular place for locals to rest and relax. Just below the park is the White Hall and a Flower Exhibition Centre and just above the traffic point is Mintogang, the official residence of Chief Minister of Sikkim. Mintogang in English means ‘blossomed crowned hilltop’. At the time of my visit the Flower Exhibition Centre had orchids on display. Entry to the show was Rs 10 per person. We walked in the park for about 30 minutes. The crisp mountain air cheered us up. In the park we bought few oranges that were in season. Small in size, the fruit was truly delicious. The snack ensured that we would survive till lunch which definitely would be delayed. From the park, we drove to Gangtok’s cable car. It’s a 2 km to and fro ride that takes about 15 minutes to complete and costs Rs 70 per head. Invariably, there would be a waiting time despite the car taking in 20 passengers at a time. 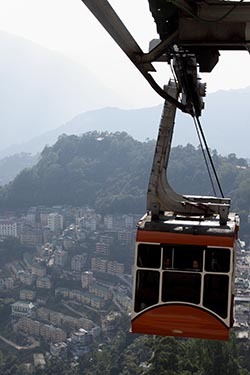 The cable car offers a bird’s view of the town and the valley. After the cable car ride, we drove to Do Drul Chorten. 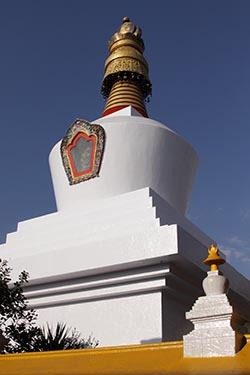 Acclaimed to be the most important Stupa in the State Sikkim, Do Drul Chorten Stupa was built by Trulshi Rimpoche, the head of the Nyingma order of Tibetan Buddhism in the year 1945. This sacred Stupa is crowned with an exorbitant gold gilded dome top which exhibits 108 prayer wheels (Mani-Lhakor). This highly esteemed Stupa is also characterized with complete Mandala sets of Dorjee Phurba, a set of Kangyur relics, complete Zung and other religious objects. The Chorten is surrounded by two majestic statues of Guru Rimpoche. It was past 2PM. Before we called it a day, there was one more ritual to complete. 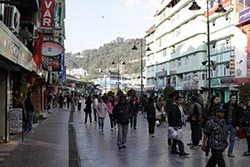 Walk the main street of Gangtok. Named M G Marg (Mahatma Gandhi Road), this is a pedestrian zone. Recently renovated, both sides of the road have shops, restaurants and hotels. It is where the action happens… kind of a melting pot were tourists and locals mingle. This is a good place to do your souvenir and general shopping. After exploring the road for about 60 minutes, we enjoyed a small lunch in one of the restaurants. By the time we reached our hotel it was 4PM. Since it was winters, darkness was setting in. It was New Year’s Eve. The hotel had organised a gala dinner, albeit on a smaller scale. Had we more time on hand I would have loved to visit Enchey and Rumtek monasteries. But sadly that was not to be. We were informed by the travel desk that our permits to travel to Nathula Pass were done. The taxi would pick us up at 8:30 the next morning.